Behold McLane Stadium, the Jewel of the Brazos, resplendent in all it's evening glory. 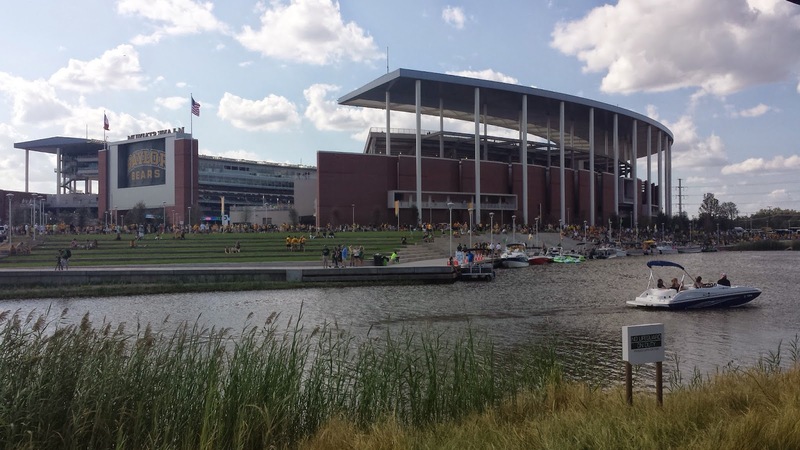 This past Sunday marked the start of the 2014 football season for the Baylor Bears, and the inaugural game of the inaugural season of anything else we can use inaugural for McLane Stadium, Baylor's new $266 million adventure on the banks of the Brazos River. I could go into my analysis of the game and how it went (45-0 shutout against SMU), but that has already been done here and here and here. Nor am I going to give any sort of medical analysis on Bryce Petty's day-to-day back injury (or even how well we played considering Petty was injured and we were missing Goodley and Coleman for pretty much the entire game). Instead, I figured for my first blog post in about 6 months, I would give a report on the good, bad, and ugly of the stadium and game day experience. So here goes. Let's start with the good. I mean, Baylor got several things right when they built this stadium. For starters, the stadium. It is quite easily the nicest athletics facility I have ever attended (better than AT&T, save the massive video screen). Even the positioning of the stadium so that over 2/3 of the stadium were shaded by kickoff of the 6:30 game was prime. Then let's talk food. I'll be honest, I did not partake in much stadium munching, but man the bacon-wrapped onion rings and bacon-wrapped hot dogs seem like they are a tradition I will soon take part in at another game. Overall the number of vendors increased quite a bit, and that's a plus. Also have to admit the condiments stations appeared to be an upgrade over the clear plastic towers of packets at the Case, but they were out of ketchup at one and mustard at another during the first quarter, so they might could do a better job watching that. Video board - amazing. So good I caught several people even in our lower section watching the game on the board rather than the field - much like you see at AT&T. I'd call that comparable behavior complementary of the video board performance. The Baylor In-Game App. Gotta admit I didn't use this much, mostly because I was watching the kids while watching the game, but I did play with it a little. Two features I checked out enough to give definitive thumbs up - Parking assistance - gave clear directions and map on how to get to our parking area, and the on-field cameras where I got live-feeds of one of 5 or 6 field-level camera angles. That was nice. I do suspect the app was responsible for some of our collective battery drain (both of our phones and several other folks complained of no cell phone battery), but the app has potential. If I were there without children, I would likely have a constant, ongoing second screen. A little bit of "sailgating"
The boats. You can't argue with this one either. The "sailgating" experience looked tremendous, with what I hear were around 50 boats in the area. Downside? Not enough slips. I think it was around 10 first-come-first-served as well as the 16 pre-reserved slips. Might need more boat parking. The bathrooms. Looking for a trough? Try again. And the number of bathrooms also a positive. The tailgating areas. Large and spacious, and with generally good views, the new tailgating areas were superior to the riverside spots at The Case in many ways. Not to mention the fact that they were out of the general path of traffic. Grant Teaff Plaza. Looks like a lift-and-lay from Floyd Casey. I was happy to see it made its way over there. The tailgating experience. Overall, there seemed to be a broader expanse of tents and food and beer and love of football, etc. Also loved the "mid-deck video banner" - just something that seems commonplace in new stadiums, but was definitely missing in Floyd Casey. Seating. The seating had narrower sections (requiring fewer people to stomp over you to come in and out of the row) as well as more legroom (reducing need to stand up to let people in or out of the row, even for a giant like me). The coin toss. I know we will have different folks, but having RG3 fist-bumping George W. Bush when tossing out the first coin at McLane Stadium (and surrounded by the McLane family) was a nice touch. Finally, I was a big fan of the repositioning of the Baylor Line. At Floyd Casey, the Baylor Line resided in a couple of sections in the middle of the "visitor side" of the field. The thought process was that they would be able to effectively heckle the opponent throughout the game. McLane maximizes this by reducing the DEPTH of the Baylor Line section, and stretching it the length of the sideline so they can more effectively heckle away. I also like the picture of the golden "dragon" with the line waiting on the team with the fire-spewing arch for them to pass through. OK, maybe it isn't all bad here, but could be filed under "could be improved" instead. These are things that generally made the day less pleasant than it could otherwise have been. Number one complaint: parking (or lack thereof). Sure, you can make the argument that we are in no worse or different situation than other Big XII schools or otherwise. That said, we were spoiled. Floyd Casey had ample parking within 100-200 yards of the stadium that you could park around the stadium even when it was sold to capacity. McLane lacks that tremendously. Not only are there no "day of game" parking spots available, but the prepaid spots aren't even enough to satisfy the Bear Foundation members, and many/most of them require shuttles (or a 15 minute mile long walk) to get to the bridge, which are certainly impediments to dragging a full cooler and tailgating chairs if you are joining others in the tailgating area. East-West bridges (or lack thereof). Currently, there is one bridge connecting the primary tailgating area with the stadium. This becomes particularly important during the Bear Walk (which is the next unfortunate planning), but in general, this bridge was so crowded during the hour prior to game time that I saw 4 people trying to SCALE THE OUTSIDE of the bridge to get across heading against the grain of traffic. Two went back, and two were given scoldings by the police after they made it across. Still, that's a problem. Additional bridges, rails or something dictating "flow of traffic" to create channels of people that can go West to East as well as East to West, or other options might help the congestion. It was also suggested that after people stop gawking at their bricks in the walkway or the RG3 statue in the concourse that the congestion improves. We will see. Of note, it did clear up closer to kickoff, so perhaps that's a sign of things to come. Lack of additional East-West and North-South bridge options. Not only the above, but further East. There MAY very well be smooth ways to head east to the Ferrell Center parking, but they were not readily apparent and advertised. As such, there was heavy reliance on foot traffic along University Parks drive with no relief from heat or sun. A shaded, along-the-river walk would be preferable, and if there were additional North-South cross-Brazos bridges to the tailgate area or otherwise, the long walk to get to the footbridge could be broken up and foot traffic might also be reduced. The Bear Walk. Further complicating the lack of bridges is the decision to block the ONLY connector from the tailgating area to the stadium for an HOUR to allow the players to walk single-file across the bridge. While it provided a cool visual and a great "tunnel" experience for them, it was a model of inefficiency in terms of allowing traffic on EITHER side to pass across. Again, having some way for traffic to be less congested would be beneficial. Some better bathroom signage. The women's restroom was on the back wall of the stadium with signs that did not adequately point all the way around. Led to several women looking lost or taking up the family restroom (leaving several families standing around outside). I also heard the tap water was hot - that sounds like a problem. More food. I saw the bacon wrapped onion rings, and visited a couple of places and saw they had some good offerings, but I appreciate a variety. Doesn't have to be State Fair of Texas sized variety, but would love more than what I saw. As it was, there were several "burger, chicken tenders, and fries" with one tricky additional option available. Maybe I was at the wrong places. The RG3 statue. Hey, it's a great statue. And Robert Griffin III definitely is a class-act without whom this stadium might not be in existence. That said, I am extremely reserved about immortalizing people in statues when they are still alive, let alone when they have active career in front of them. Same argument goes to not awarding Heisman trophies to Freshman (crab legs or autographs, anyone?). I think it was a great gesture, the panels look great all lit up, but just want to caution against getting too giddy over living legends in the future. Don't think it could be a problem? Ask Penn State about their Paterno statue. In summary of this giant post, McLane Stadium is awesome. You should visit it for sure. Only if you have not already visited, you likely cannot since it is sold out for the year. So there. I, on the other hand, will visit it. Again. And again. Looked really cool on TV!